LATICRETE has introduced Ready-to-Use Grout, an advanced professional-grade, ready-to-use grout that delivers superior color consistency and excellent stain resistance. To save time and money on the jobsite, the product does not require mixing or sealing and can be spread continuously for up to 20 minutes before cleaning is required, which is a significant improvement compared to other products on the market that require cleaning after only five minutes. “Since its inception, the experts at LATICRETE have developed revolutionary grout technology to solve age-old grout problems such as discoloration and cracking. 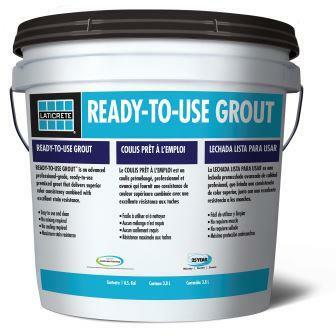 Ready-to-Use Grout is a tremendous addition to our full product portfolio as we continue to develop products that ease the work of the installer and meet the needs of even the most demanding timelines,” said Ryan Blair, LATICRETE Senior Product Manager – Grouts & Sealants. Ready-to-Use Grout is ideal for both commercial and residential interior installations and re-grouting applications involving ceramic tile, glass tile and stone. In addition to its non-sag formula for walls and floors, it is crack resistant and inhibits the growth of stain-causing mold and mildew in grout joints that are 1/16 inch to 1⁄2 inch (1.5 to 12 millimeters) wide. For color customization to enhance grout lines and complement the chosen tile, Ready-to-Use Grout is available in 40 colors, including a unique Translucent option that contains glass beads which allow for light to pass through and reflect the colors of the surrounding tiles. “Thanks to its exceptional color consistency and high-performance stain resistance, builders and homeowners can enjoy a uniform color that brings their design visions to life,” added Blair. Available in a gallon (3.8 liter) pail, Ready-to-Use Grout is a component of the LATICRETE 25-Year System Warranty.